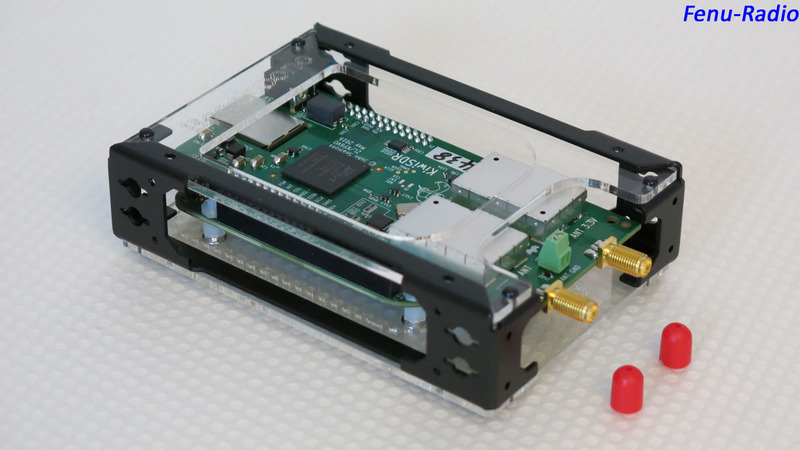 In the middle of 2016, I came across an interesting software-defined radio project on a crowdfunding platform on the Internet. The KiwiSDR! This SDR was developed by the Funkamateur John Seamons ZL / KF6VO and brought to production. Why is the SDR called "Kiwi"? This is the kiwi bird, the national symbol of New Zealand. Because the developer spent some time there, he renamed his project, originally from WRX (web receiver) to KiwiSDR. It also had copyright reasons according to the website of the KiwiSDR. The KiwiSDR is a so-called network SDR. This means that it is operated via the local PC network. A highlight is however, it can also be remote controlled over the Internet. Four users can access it simultaneously and independently. The KiwiSDR is optionally registered on the website http://sdr.hu/ and can be used by everyone at any time free of charge. In the meantime, many KiwiSDR owners have registered their device there. These are spread over the whole globe, partly also at exotic locations. A feature in this price class is the GPS connection. This is used for the time synchronization of the BeagleBone and the frequency stabilization of the KiwiSDR. Only frequency stabilization at present. For the KiwiSDR to run on a network, it needs a web interface. This is located on the connected board. This board is the so-called BeagleBone computer with its own operating system. 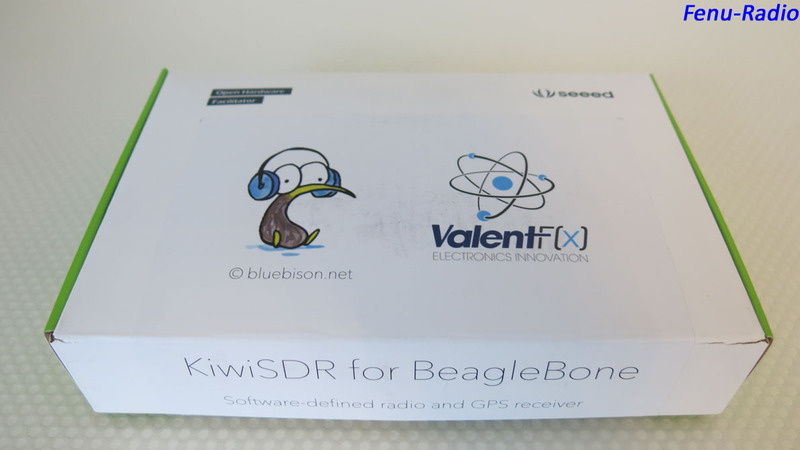 The combination of KiwiSDR and BeagleBone form one unit. This combination is connected to a router or directly to a computer via an Ethernet cable. The nice thing is, the KiwiSDR is independent of the operating system of the computer from which it is accessed. No special software is required to be installed. It is controlled via the Internet browser. The browsers Chrome, Firefox, Opera and Safari work with the KiwiSDR. Windows Internet Explorer is not working. Upon request from the company WiMo in Herxheim (DE), Ekki (DF4OR) sent the KiwiSDR for tests and comparisons. At the beginning of January 2017 the device arrived. The KiwiSDR is a kit for the end user. The electronics do not have to be soldered. The already assembled boards (KiwiSDR & BeagleBone), which are packed in an antistatic film, must be installed in the supplied housing. The housing consists of a second aluminum frame and two Plexiglas plates. There are only four screws to tighten. The rest is fixed with spreader rivets. Time required 10-15 minutes. A small note about the assembly: Care should be taken before touching the electronic boards, grounding on a grounded object. This is to dissipate static electricity. Otherwise, the sensitive electronics could be damaged. To run the KiwiSDR a 5V power supply, an Ethernet cable, as well as an adapter from the SMA to BNC / PL is necessary. These important parts are unfortunately not included. In the power supply, special care is required, if you do not want the reception to deteriorate right from the start. Unfortunately, there are hardly any analogue 5V power supplies available. One must almost inevitably resort to switching power supplies. It is definitely worth investing in a good switching power supply. We know now, the cheap and noisy switching power supplies can cause reception disturbances. The following power supplies I have tried and found good. There are several possibilities to put the KiwiSDR into operation. - Via a serial interface. Link: http://kiwisdr.com/quickstart/index.html#id-net-serial (Only for debug login access to Beagle. Cannot run KiwiSDR interface this way). The KiwiSDR can be operated on all operating systems. The Internet browsers Chrome, Firefox, Opera and Safari are supported. The Microsoft Internet Explorer does not go unfortunately. Maybe you can not access the KiwiSDR yet, because once it is connected to the Internet, connects to the update server and automatically downloads the latest software updates. A corresponding message is displayed. This takes a few minutes. Now the KiwiSDR can be started. If everything is configured correctly, the user interface appears in the browser window. You can also connect the KiwiSDR directly to the PC. The network port of the computer is used for this purpose. Before doing this, installing a small utility is necessary. In order to access the KiwiSDR "kiwisdr.local:8073" address in Windows, a mDNS service must be installed. The easiest way is to download iTunes from Apple and install it. In iTunes, "Bonjour" is included that contains an mDNS service. ITunes can then be uninstalled again. Bonjour is preserved. If you enter the address "kiwisdr.local.8073" in the address bar of the browser, the operating software of the KiwiSDR should start. If the network connection on the PC or laptop is used for Internet access, you can use the KiwiSDR via a USB port. This requires a USB network adapter. The mDNS service must also be installed for this method. Install and uninstall iTunes. Bonjour is preserved. Bonjour contains the mDNS service. If you enter the address "kiwisdr.local:8073" in the address bar of the browser, the operating software of the KiwiSDR should start. The big feature of the KiwiSDR is accessibility over the Internet. A total of four users can simultaneously access the KiwiSDR. An interesting thing, e.g. is trying to get exotic locations. On the website "http://sdr.hu/" are all KiwiSDR and also other platform compatible SDR's listed. By clicking on the links there, you connect to the corresponding SDR. If you want to share your KiwiSDR with other users, a few small hurdles have to be overcome. Basic knowledge of network technology is an advantage. Here is a brief guide. - On the router, enable port forwarding to port "8073" under TCP. - Connect KiwiSDR to the router and start up. - Test whether the KiwiSDR can be operated locally. - Register with a DNS provider. For example, at https://www.noip.com. This provider is free. You just have to confirm your account by e-mail every 30 days. - If the router supports the DNS function, the data obtained from the DNS provider is entered in the corresponding input fields of the router. - If the router does not support the DNS function, a dynamic update client (DUC) can be downloaded and installed from the provider. Enter the KiwiSDR address, password, etc., and start the client. This client automatically searches the KiwiSDR for its address, e.g. my-kiwisdr.ddns.net:8073, and connects it to the DNS server. The disadvantage of this is that when the KiwiSDR is accessible over the Internet, the PC must be on because of the DUC. - Register on the website "http://sdr.hu/register". - Enter the address "kiwsdr.local:8073/admin" in the address bar of the browser. The configuration pages of KiwiSDR will open. - Enter the key received by mail under the "sdr_hu" tab in the "API key" column. Fill out all other fields with the necessary data and restart the KiwiSDR with the "Restart" button. 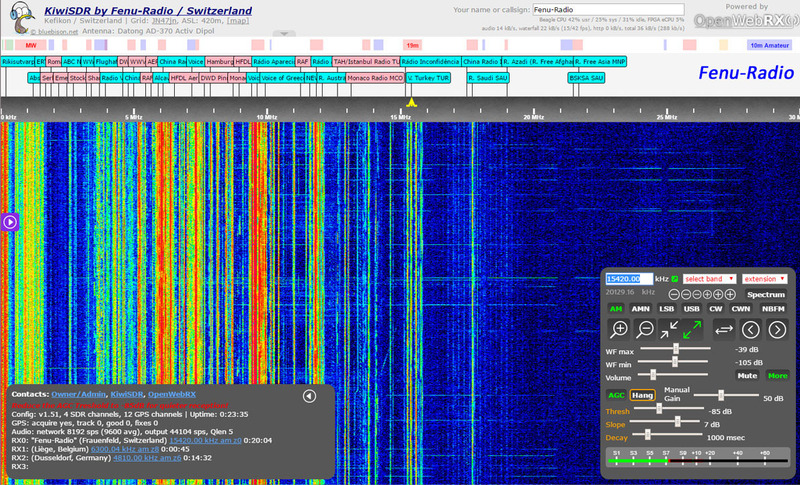 After a few minutes the KiwiSDR will appear on the website "http://sdr.hu/". If this is the case, it is available to other users. - Further information and details can be found at "http://www.kiwisdr.com/KiwiSDR/index.html". - If you want to use the KiwiSDR only for the Internet, it does not need to be registered on "sdr.hu". Simply use the name given at "https://www.noip.com". That could be "my-private-kiwisdr.ddns.net:8073”. After entering "kiwisdr.local:8073" or via Internet, e.g. "http://mein-kiwisdr.ddns.net:8073” the software starts. This is divided into three parts. The waterfall with frequency scale, the editable frequency list and the spectrum that can be switched. On the left side are two pop-up windows. The lower gray shows information about access and usage. The upper violet window is a guide with links to further information on the manufacturer's web page. At the bottom right is the actual control of the KiwiSDR. There, all essential settings are made. Operating modes, waterfall settings, zoom, AGC, and volume control are available there. The yellow bar on the frequency scale represents the set bandwidth. If you click on this bar and hold down, it can be moved to any point on the scale, resulting in a frequency change. If you click on the ends of this yellow bar and move it, the bandwidth can be adjusted freely in 10Hz steps. The other way to set the bandwidth is to click on the +/- characters while holding down the Shift key. This allows you to change both ends of the bar at the same time. -- Click / hold and move yellow bars in the frequency scale. -- Click on the predefined frequency memories, which are placed in the upper frequency list. -- Just click in the waterfall to the desired frequency. -- Direct input at the top left of the control panel input field. -- The control block has three minus and three plus signs. With these you can adjust the frequency with the steps 100Hz, 1KHZ, 5KHz. On LW & MW, the 9 / 10KHz switchover is automatically displayed. If you hold the mouse pointer on the waterfall and turn the mouse wheel, you can zoom in and out the waterfall and spectrum. The KiwiSDR administrator can create, modify, or delete the entries in the frequency list. If the KiwiSDR is operated locally, click on a vacancy or an entry which is to be changed while keeping the Shift key pressed. Then a dialog opens, where you can enter the data. These changes can also be made via the Internet, but the password function must be activated and a password entered on the / admin page. On the control block, there are other functions such as band selection and extensions. -- S-Meter. Blendet ein Fenster ein, wo der S-Meter Verlauf angezeigt wird. -- Integrate. Audiotool zur Analyse von diversen Audiosignalen. -- IQ Display. Visuelle Einschätzung von PSK Modulation. Auch für AM anwendbar. -- Loran-C. Decodierung von Loran-C Signalen auf 100KHz. -- WSPR. Ermöglicht die Erkennung von Ausbreitungsbedingungen. The KiwiSDR was operated on numerous antennas. At home, as on the DX camp in the Holzerbachtal near Solingen. The KiwiSDR was compared above all with the Perseus SDR. This can also be remote controlled over the Internet and also has a 14bit ADC. As always, I began with my reception attempts at the lowest, receivable frequency. The only antenna home that receives the alpha signals from Russia is the Datong AD370. 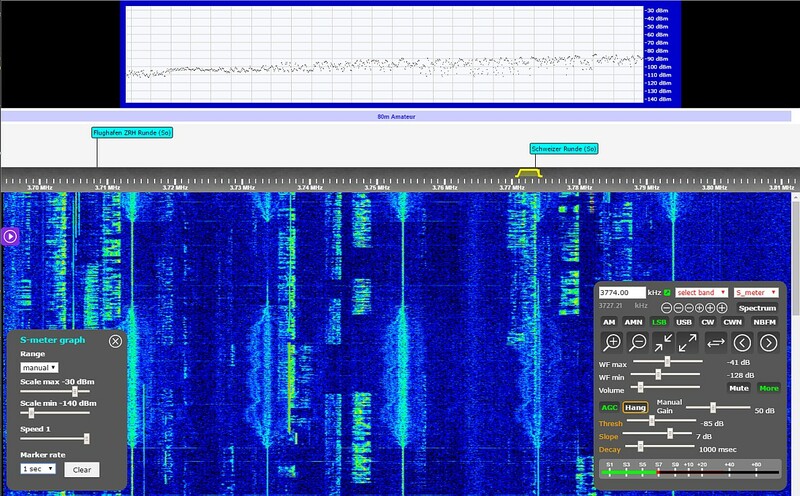 At 11.9KHz the signals were then also heard and seen on the waterfall of the KiwiSDR. Both of these devices were of equally good quality, the KiwiSDR had a slight advantage, because the audio playback a little less than the Perseus. What is still striking in comparison to the Perseus is the rough resolution of the waterfall presentation. The Perseus has the much finer resolution. The signals are therefore better seen in Perseus. Next we went to the time signals. At 77.5KHz, there is a balance between the two. On the long and medium wave the sensitivity was the subject. Both are about equally sensitive. In the understanding of AM signals, the KiwiSDR here is something. The audio is duller than that of the Perseus, but is more pleasant in the long run. On the short wave the differences between the two devices are small but audible. The Perseus with the original software 4.1a has a high-pitched noise, which on the one hand increases the intelligibility somewhat, but on the other hand tires. The KiwiSDR has a somewhat duller rendering. The same picture in the SSB modes. With the KiwiSDR, the lingering on a frequency is more pleasant. In the higher bands the slight insensitivity of Perseus makes itself felt again. Here the KiwiSDR can score points. Although the KiwiSDR has no preselection except a low-pass filter at 30MHz, no major signaling problems or ADC overruns were detected during the entire test phase. Unfortunately, the software of the KiwiSDR has neither a noise suppressor, noise suppression, attenuator or notch filter. The integration of frequency lists such as Eibi and Aoki was not yet possible at the time of testing. This will presumably still incorporate everything into the software, the software was at the time of the test still in the further development. Several updates per week were not a rarity. The operation of the two differs significantly in some points. In comparison; The Perseus SDR is more comfortable and intuitive to use. The KiwiSDR has a very long response time between input and response of the SDR. For example, Changing the volume with the slider, it takes almost 2 seconds until the volume change becomes noticeable. Below are a few audio comparisons between the KiwiSDR and the Perseus SDR. The KiwiSDR is an interesting SDR project that has quickly found many supporters. Note the number of devices that are currently online at http://sdr.hu/. In comparison with the Perseus he does not need to shun, because the KiwiSDR pulls with the Perseus practically the same. Due to the duller reproduction, it loses some comprehensibility, but is more sensitive to this in the upper frequency ranges. The built-in GPS receiver is a novelty in this price class, but is somewhat insensitive. The good antenna compatibility surprised me. At the DX-Camp, on a 60m horizontal loop, no oversteering effects were detected. Even at home antennas no problem at all! For some the configuration for bringing online is difficult. You need some basic knowledge of networking technology. Above all, the KiwiSDR is a successful receiver with great features and easy operation. Very good price / performance ratio! Many thanks to the radio retailer WiMo for the loan of the KiwiSDR.